Housers is a real estate investing platform that targets properties in Southern Europe. They have a wide variety of investment types to choose from. Housers is a platform for real estate asset investing, focusing on the European market. They began their operation in January 2016 in Spain. They have gradually expanded their operations, opening up in Italy during April 2017 and in Portugal in August 2017. All of their investments have links with real estate assets. They provide monthly income for their investors and they aim to diversify their offerings through having a presence in numerous countries. They are one of the first platforms of this kind to target the European market. They are open for all levels of investor, with the minimum investment only being €50. They aim to provide maximum transparency to investors and carefully select the properties. Housers try to make the entire process simple, with the goal of realizing consistent returns with low levels of volatility. At Housers, they specialize in three types of investments. These are development loans, buy to let and buy to sell. They also have plans to get into the art buying space in the future and offering this to investors. You can choose from buy to let, buy to sell and development loan investment options. Within each respective categories there is also a lot of choice. As Housers offers properties in three different countries, you can diversify your exposure to certain property markets. You also have a variety of different types of investments to also help do so. You can invest as little as €50, which is great for those just getting started with real estate investing. While in parts the website is good, there is some outdated information and the navigation system can be clunky. A lot of people prefer to be hands off with their investments. With Housers, you have to annually choose your investments. The main way in which Housers differentiates itself from its competition is by targeting the Southern European real estate market. At the moment, the majority of the leading real estate crowdfunding investment platforms target the North American market. Housers has exposure currently in three different countries, which provides added diversification in comparison to those platforms only dealing in one country. They also plan on expanding their offering into other countries in the future. 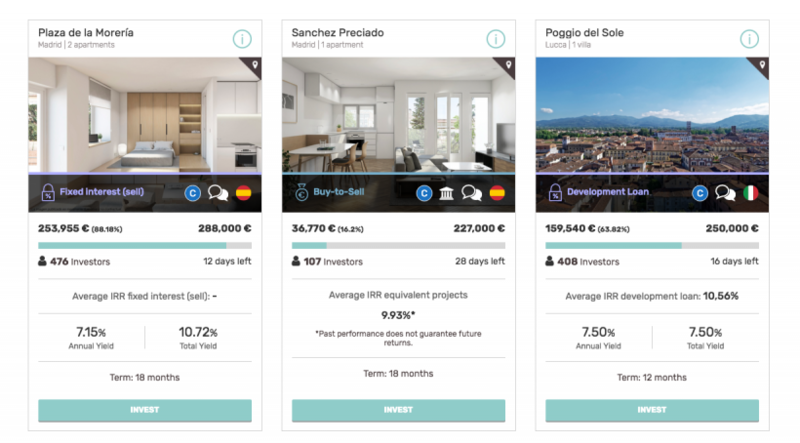 The offering is good in terms of selection and with the low minimum required investment of €50, they are an ideal platform for those people looking to dip their toes into the real estate investing space. The expected annual return at Housers is between 4% and 10%. This is a bit lower than some of their competitors when you take into account the 10% on all profits that your investments have made through the platform. Another drawback is that there is no auto invest feature. Therefore, you will have to manually go through the various properties on offer and decide for yourself which ones suit your specific needs and preferences. There is also no buyback guarantee in place, unlike a lot of their competitors. Finally, their website is a bit outdated in parts and has a lot of unnecessary information in key places that can be distracting when trying to navigate around the site. With Housers, you will be paying a 10% fee on all profits that your investments make through their platform. One of their key features is the wide selection of different properties, all of which are located in Southern Europe. There are not many platforms that have such an offering in this region, especially for English speakers. One of Houser’s standout features is being able to make investments of as little as €50. This means that there is a low barrier of entry to get involved in the market. The platform makes sure that your investment is kept protected by using a payment processor which has approval from the Bank of Spain. It is through their team of experts that they carefully select the properties that are on offer through this platform. They utilize innovative tools and big data to make their decisions. Housers works in a very simple and straightforward way. The first step is to sign up for an account. You will need to provide a copy of your ID in order to verify this account and get started investing. Once this has been done, you can then add funds to your account by credit card or through a bank transfer. You can then invest in three different types of investments. These are buy to let, buy to sell and in development loans. You select which is best suited to your needs and you can look at the properties that are on offer through these respective options. You can then easily manage your investments and hopefully watch them grow over time through the account dashboard. With your investments, you can either hold them for the entire term length or you can sell them on the platform's secondary marketplace to other users. With the buy to let option, you will be earning rent on a monthly basis, proportional to the amount you have invested. You can sell this investment at any time through the platform’s marketplace. This option has the most optimal yield to risk relationship. With buy to sell, you will receive your capital back as well as any capital gains when the property has been sold. You can also sell your investment on the platform's marketplace. With the development loans, the interest rate is fixed from the start. You earn monthly interest. Sometimes there are personal guarantees as part of this loan. 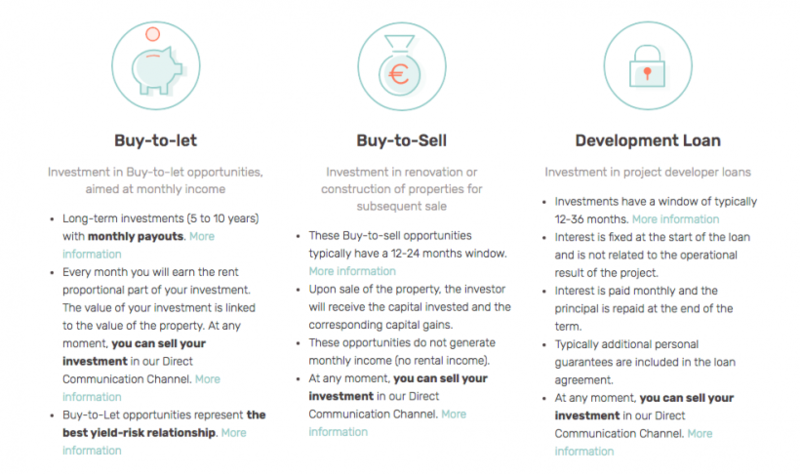 This investment type is for opportunities to buy to let properties and look to offer monthly income. These are long term investments, about 5-10 years in length. This is an investment in constructing or renovating properties and then selling them on for a profit. These are shorter term investments, usually around 12-24 months in length. This is an investment in the loans of project developers. These usually will have a life period of 12-36 months. In order to make a deposit to your Housers account, you have two options. You can do so by bank transfer. This will take a few working days to process. Housers using the Lemonway payment processor for bank transfer transactions. This processor focuses on providing a platform to make secure payments. Alternatively, you can make a deposit by using your credit card. All of the major credit and debit cards are accepted. You may be subject to fees imposed by your specific card provider. If you have an issue or have a query that you need answered, there are a few ways in which you can contact the Housers customer support team. You can call them by phone at one of their offices, you can send them a letter by email to one of the offices or you can send them an email. Housers is licensed as a participatory financing platform in Spain. They are under the oversight of the CNMV financial market authority. They have the necessary approval to operate in other European countries due to the passporting rules of the European Union. They use a trusted payment processor for their transactions which as been approved by the Bank of Spain. The platform is reliable and you have ways in which you can exit out of your investment early if you wish to do so. Beginner investors who are looking to dip their toes into real estate investing. This is thanks to the low minimum required investment of €50. Investors looking for diversification. As Housers has a presence in three different European countries, this helps diversify the risks. Investors looking for a variety of different investment options. There are three main types of ways you can invest with Housers, each of which also has a wide selection of properties to choose from. Investors looking to explore new markets. There are very few platforms like Housers that offer investment opportunities in Southern Europe at the moment.